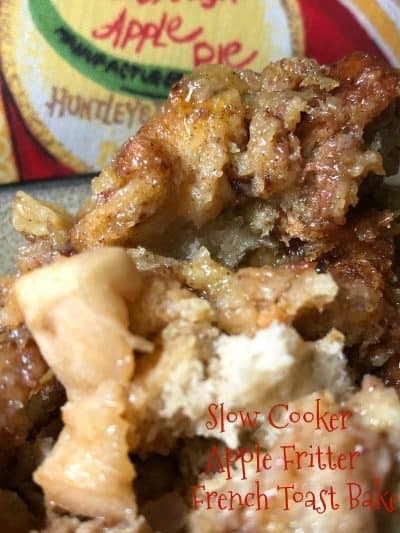 Slow Cooker Apple Fritter French Toast Bake is a delicious french toast-style bake. 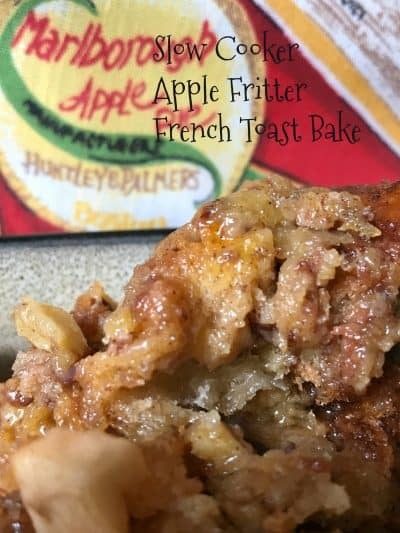 Made in your slow cooker, apple fritter french toast bake “bakes” on high for 2 hours. 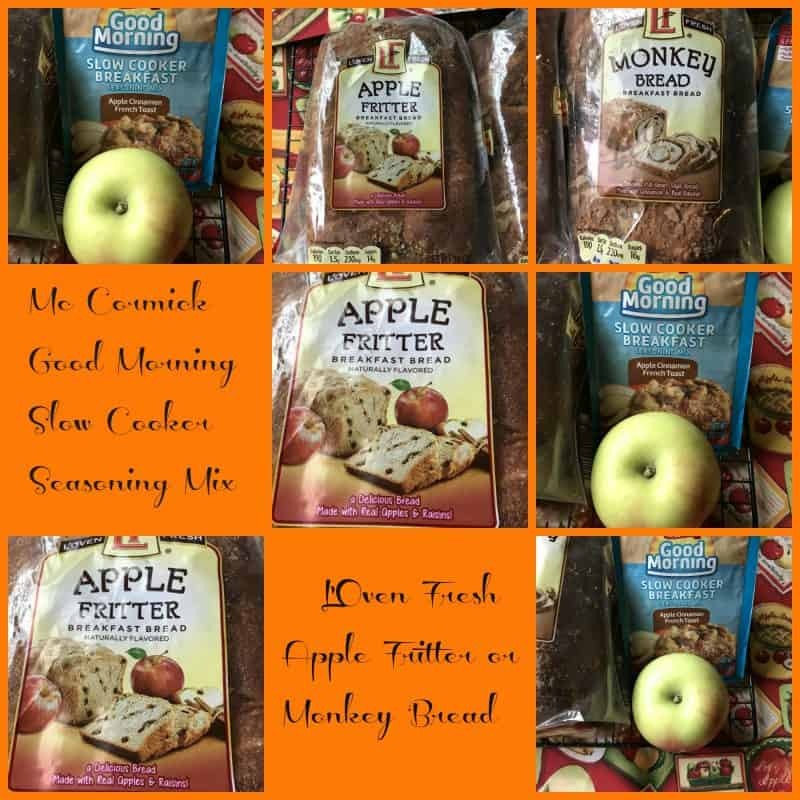 Cubes of apple fritter bread are combined with eggs, milk, diced apples and a new (to me) product, Mc Cormick® Good Morning Slow Cooker Breakfast Seasoning Mix. Serve this yummy slow cooker bake with maple sausages, orange juice and warm maple syrup. Apple Fritter Bread is the perfect bread for this easy french toast bake. I had stopped at my favorite farm stand and picked up some apples, so when I saw apple fritter bread at Aldi, I knew exactly what I was going to make. Not only did Aldi have apple fritter bread, they also had loaves of monkey bread. I bought 2 loaves of apple fritter bread and one loaf of monkey bread. Apple fritter and monkey bread are products of L’Oven Fresh. In the seasoning aisle at Aldi, I stumbled on Mc Cormick® Good Morning Slow Cooker Breakfast Seasoning Mixes. I couldn’t believe my good fortune! Apple fritter bread, Good Morning apple cinnamon seasoning mix and apples. Definitely the perfect match. Mc Cormick® seasonings and seasoning mixes have been around for as long as I can remember, so I was anxious to get home and try out these “new” seasoning mixes. Apple Season is here! 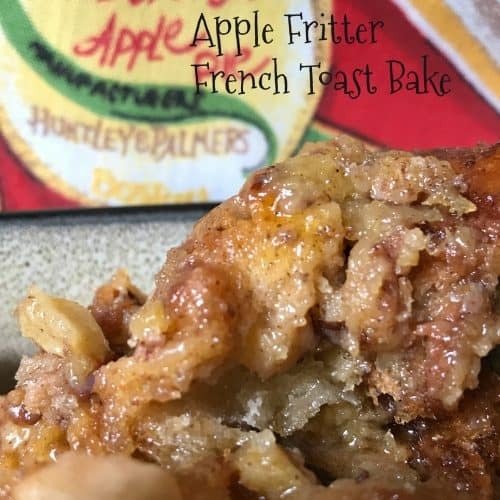 Slow Cooker Apple Fritter French Toast Bake is the perfect breakfast to enjoy before heading out the door for a day of Autumn fun. A day of apple picking, farmer’s markets, raking leaves or attending one of the many Fall Festivals that are taking place this time of year. Cranberry Festivals and our favorite Bayfield Apple Festival. Try all of Mc Cormick® Slow Cooker Breakfast Seasoning Mixes. Mc Cormick® Good Morning Peaches and Cream Oatmeal Slow Cooker Breakfast Seasoning mix, Mc Mormick® Good Morning Ultimate Egg Casserole Slow Cooker Breakfast Seasoning Mix, Mc Cormick® Good Morning Mexican Egg Casserole Slow Cooker Breakfast Seasoning Mix and Mc Cormick® Good Morning Apple Cinnamon French Toast Slow Cooker Breakfast Seasoning Mix. A delicious French toast bake made in the slow cooker. 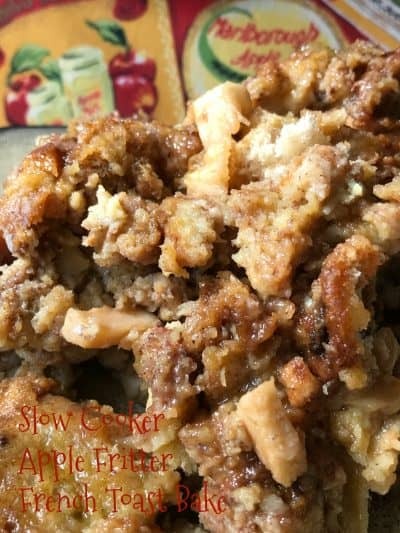 Apple fritter bread, milk, eggs, diced apples and Mc Cormick Good Morning Slow Cooker Breakfast Seasoning Mix are combined together and baked in a slow cooker for 2 hours on high. Serve with Maple Syrup. Mix eggs, milk, seasoning mix, cinnamon and sugar in large bowl until well blended. Add bread, toss to coat. Pour into a 6-quart slow cooker sprayed with non-stick cooking spray. Cover with clean cotton kitchen towel or double thickness of heavy-duty paper towels, overhanging sides of slow cooker*, place lid on top. Cook 1 1/2 hours to 2 hours on high or until until top of french toast no longer looks wet. Serve warm with warmed maple syrup or warmed caramel sauce. *Covering the slow cooker with a towel helps prevent moisture buildup and making the french toast overly soggy. 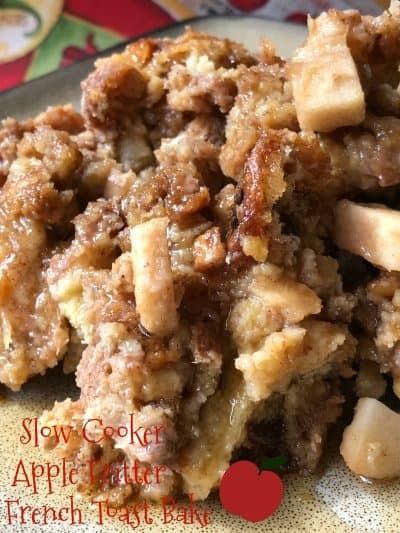 Slow Cooker Apple Fritter French Toast Bake can also be served with warmed caramel sauce for a decadent and different dessert. Our favorite brand of caramel sauce is from Ecker's Apple Farm and Caramel Sauce. Hungry for more French Toast Recipes? We have several you are going to love. Chocolate Chip Panettone French Toast Bake, Chocolate Chip Brioche French Toast and Pumpkin Cobbler French Toast Casserole.